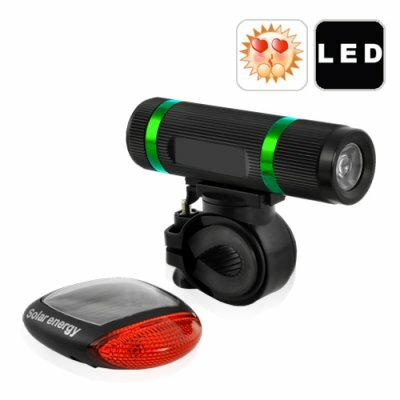 Successfully Added Super Bright LED Bicycle Light Set - Solar Edition to your Shopping Cart. Notify drivers and other cyclists of your presence with this Super Bright LED Bicycle Light Set. Equipped with a super-bright white LED for the front and a clear red LED for the rear, this light set ensures high visibility to other road users and is ideal for all-round safety precautions. Best of all, the rear light is solar powered, meaning you'll never need to worry about battery replacements or running out of power when you need it. Riding at night can be risky, but the dangers of the road can be nullified with this Super Bright LED Bicycle Light Set. The front white LED will both light up the path for any hazards and announce your presence to incoming traffic, while the rear red LED will alert vehicles of your location so they know to avoid you. Best of all, the rear light is solar powered, which means the battery is recharged during the day and always ready for use at night! -Long lasting: The front white LED provides up to 100 hours of run time on only three AAA batteries, while the solar panel on the rear red LED can make it last for four hours after only a two-hour absorption of sunshine.